Outside or inside the office, no good comes from gossiping. When you’re in the office, you run the risk of having your words circulate and offend teammates or even your boss. Do your best to take the high road, and stay away from it. Did that project you’ve been working on not get completed on time? Did that report get lost in the shuffle? Don’t fall into the trap of passing the blame on your teammates, because nobody trusts the person who is not accountable. Being negative is a bad habit that can weigh heavy not only on your career, but your life. Others won’t appreciate it if you’re always bringing up the bad and constantly pointing out what’s wrong. Turn your frown upside down, and look for the positive! If you keep the golden rule of mind of treating others how you want to be treated, you will avoid accidentally disrespecting your colleagues. Do you check Facebook frequently during the work day? Are you constantly texting your significant other? Do you frequently visit your office friend for a chat? These distractions are consuming your time in the office and most likely impacting your work. Be cognizant of this issue and try to focus more. Fight procrastination today – not tomorrow! If you’re constantly putting off work, you might be holding up your coworkers and team initiatives. This can result in frustration all around, so avoid it and quit putting off your work. Showing up to work late, walking into meetings after they start and even holding up the crew when going out to lunch can become very irritating for everyone. To help resolve the issue, set early reminders for yourself, get organized and avoid the snooze button at all costs. 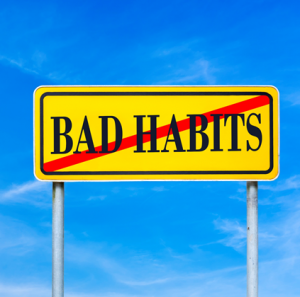 Bad habits can be difficult to break, but if they’re becoming detrimental to your career, the effort is more than worth it. Have another bad office habit or an additional tip? Share it in a comment! This entry was posted in Currently Employed and tagged bad career habits, Bad Habits, bad habits in the office, Bad Work Habits, habits to break. Bookmark the permalink.